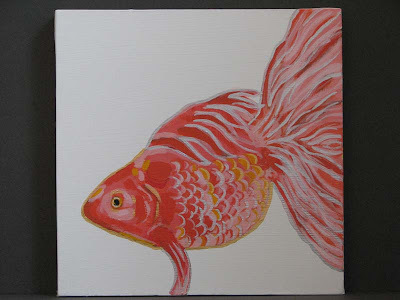 Here are a few paintings with fish. 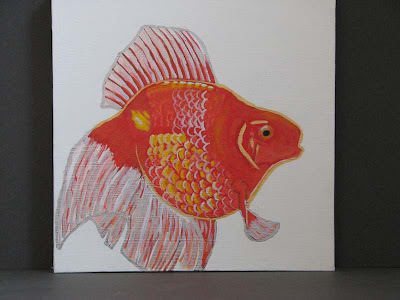 The 3 gold fish I painted a few years ago for a friend's bathroom. I made a few sketches and then transferred the drawings to gallery wrap canvas. They are done in acrylic, and I used metallic gold and silver paint so they would be iridescent in low light. I don't think there is anything wrong with doing art for the bathroom, as having my work hanging somewhere is the idea. My sunflower prints seem to make there way onto a few walls too. 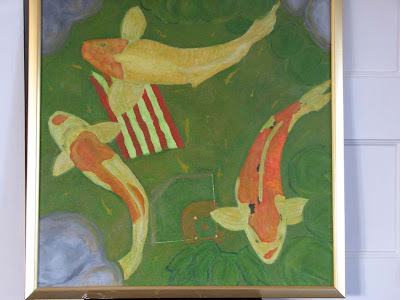 The last piece with the 3 koi is another level playing field piece, and was painted in oil. (I don't paint in oils anymore because acrylics clean up so easily.) The last piece is titled Level Playing Pond and is on canvas. Anyone interested in this piece of political satire should see me. And now a word from our sponsor, SKI CINCINNATI apparel. With fall comes a little cooler weather (I hope) and long sleeve SKI CINCINNATI T-shirts are back. Check out the selections at Joseph-Beth Booksellers in Cincinnati and Benchmark Outfitters in Blue Ash, OH. The Contemporary Arts Center and the Cincinnati Museum Center also carry Ski Cincinnati apparel. New this season are acrylic knit caps with Ski Cincinnati embroidered. Check them out too. I like the fish. 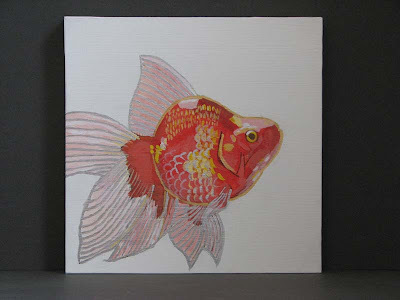 I love to eat fish and I wouldn't normally like to have a fish tank but, these fish, I like. Would make good accents for a wall, especially for an Asian theme. Great job. By the way, I have been visiting, just not posting any comments. This one moved me to do so. The Party of Welfare? I don't Think So!